Atoms and Molecules describes the basic properties of atoms and molecules in terms of group theoretical methods in atomic and molecular physics. The book reviews mathematical concepts related to angular momentum properties, finite and continuous rotation groups, tensor operators, the Wigner-Eckart theorem, vector fields, and vector spherical harmonics. The text also explains quantum mechanics, including symmetry considerations, second quantization, density matrices, time-dependent, and time-independent approximation methods. The book explains atomic structure, particularly the Dirac equation in which its nonrelativistic approximation provides the basis for the derivation of the Hamiltonians for all important interactions, such as spin-orbit, external fields, hyperfine. Along with multielectron atoms, the text discusses multiplet theory, the Hartree-Fock formulation, as well as the electromagnetic radiation fields, their interactions with atoms in first and higher orders. 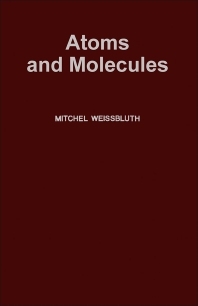 The book explores molecules and complexes, including the Born-Oppenheimer approximation, molecular orbitals, the self-consistent field method, electronic states, vibrational and rotational states, molecular spectra, and the ligand field theory. The book can prove useful for graduate or advanced students and academicians in the field of general and applied physics.